All of this is to say that, I feel like banks and supermarkets are both venues I understand pretty well, as they’re places I’ve spent more hours than I can even begin to count. 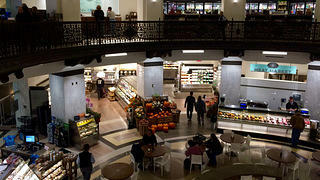 And while I know some rise above the banality of my former workplaces, I was not prepared for Heinen’s in downtown Cleveland, which, as an adaptive reuse of a bank as a supermarket, encompasses both beautifully. It’s impossible to not be blown away the first time entering the store. 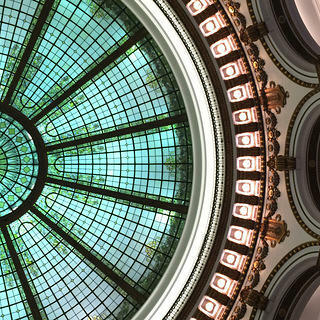 The main doors open—as so many stores seem to these days—into the “food court” area, which in the case of Heinen’s features a multi-story rotunda capped with an enormous stained-glass skylight at the top and a series of murals just below. The very center of the room is marked with the medallion of the Cleveland Trust Company in the floor, surrounded by seating for diners, and the second-level balconies feature more seating—along with local beer and dozens of wines on tap (the latter of which can be enjoyed while shopping). The bright white marble on the food court columns comes from a 1970s-vintage rehabilitation by Marcel Breuer. 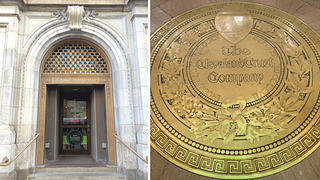 Left: With imposing stone and metal doors, the entrance to Heinen’s evokes its history as a bank. Right: The Cleveland Trust Company medallion, now located in the center of the rotunda, was moved into its current location during the Breuer renovation. 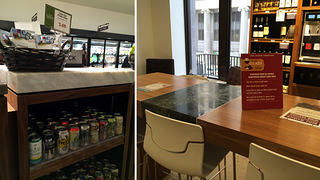 Additional marble from the Breuer rehabilitation was reused in tables and countertops. 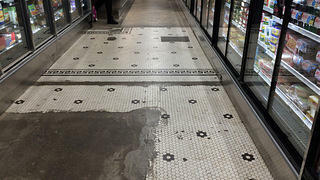 Keeping only the portions of the original tile floor that were intact was a controversial decision, but from the time the store has opened, Williams says they’re one of the most-photographed elements of the project. This led to some back-and-forth with the National Park Service team in charge of approving the project for the tax credits, as such things as exposing remaining vestiges of the original ceramic tile pattern—instead of covering it or replacing it—showed the layers of history in a way that felt authentic, but was not a traditional preservation technique. Sarah Heffern is the National Trust's director of social media. While she embraces all things online and pixel-centric, she’s also a hard-core building hugger, having first fallen for historic places in a fifth grade “Built Environment” class.